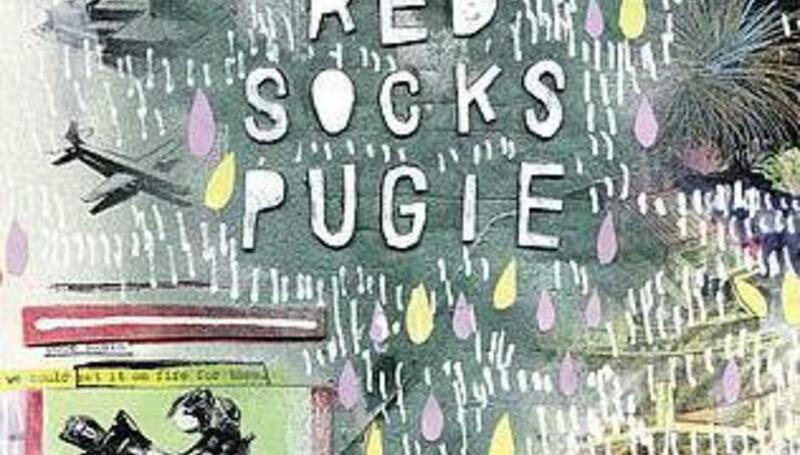 Picking a standout track, singular, from Foals’ Antidotes is tough, but put us against a wall and wave a fist our way and we might settle on ‘Red Socks Pugie’. Insistent, incessant, full of intricacies and yet oddly affecting, the song was an obvious single from the moment DiS received the album sampler months ahead of its eventual release. This isn’t rock to do your weekly calculus homework to; it’s rock to fall in love to, to collapse into the arms of an across-the-room admirer at the end of a smiles-and-sweat gig to, and to go home for the night with their hand in yours to. Proof, if any was really needed, that this Oxford five-piece are one of the few hyped acts (the only one, perhaps?) of the turn of the year to have produced goods of a quality to back up the head of steam built for them by eager-beaver press types. Somebody, somewhere, is singing along to this song and its beyond banal lyrical stream of shite from head Kook Luke Pritchard. That somebody could die tomorrow and, probably, not notice the difference in their pulse. What does “shine on”, used in a verbal sense, like to run or to leap, actually mean? Does a body burst open and blind all around them with secretly stored sunlight? We are all descendents of the Sun in a very tenuous sense, I suppose. Sorry, distracted: comes easy when a song’s as forgettable as this. Capable of making deaf and dumb baboons dance like they’re Pans People, We Are Scientists’ latest is basically the same old song with different words, but nobody at DiS is complaining. If it ain’t broke, et cetera, and ‘Chick Lit’ is 2008’s ‘Nobody Move, Nobody Get Hurt’, guaranteed to be a fixture in indie DJ setlists for the rest of the year. Not quite as boisterous, but if you were thinking the boys have gotten a little more reserved with age, watch the accompanying video. She’s seven now, but we still can’t really badmouth Britain’s Got Talent loser Connie Talbot, beaten in last year’s final by a rotund mobile phone salesman with a penchant for Pavarotti. Gonna have to wait ‘til the girl’s eight before rounding on her, hanging her out to dry. This cover of Bob Marley’s original is, essentially, The Joss Stone Formula taken to its most extreme degree. Coming next week: a Caucasian foetus drops a banging cover of ‘Simon Says’, with the Godzilla sample. Back with rather more crunch than much of their new-Millennium material, Feeder’s first single from new LP Silent Cry is lyrically weak, dross ambiguity dressed up as delectable grandeur, but ultimately will sit pleasantly on daytime rotation without offending the public en masse. It’s certainly more appealing a listen that, say, OneRepublic, fans of whom have likely forgotten this British trio ever existed. Not exactly welcome back, then, but it’s nice to hear a band genuinely trying to reinvigorate themselves at a time when bland sells so magnificently well. Sometimes there’s just no explaining the appeal of a band. If you’re a fan of sketchy indie-popsters Little Man Tate, whose shelf life must’ve passed with the rising of the Mary Rose, then please do outline their selling points in the comments section below. “Explosive return” states the blurb, “Sheffield’s beloved sons”. Perhaps it’s music PR types who’re buying enough Little Man Tate records to keep the four-piece in stripy polo shirts? Yeah, that’ll be it. Quietly making her way, Reading songstress Laura Marling follows her recent guest turn on Mystery Jets’ ‘Young Love’ with a wonderful little single that shows off her maturing talents excellently well. It’s a shuffle, a sweet saunter, of a song that doesn’t oversell its protagonist’s vocal abilities a la certain other domestic females doing the critically acclaimed rounds, and feels better for it. No doubt Marling can, if requested to, ‘belt them out’, but it’s softer-edged, slow-release numbers like this that are essential in making her an artist of considerable longevity. If you’ve pennies enough for a pair of singles this week, consider this our runner-up. Nuneaton’s answer to !!! tsk-tsk-tsk their way through widdly guitar lines and yelpy vocals without actually telling us a damn thing about them, save for the fact they most probably like !!!. If you like !! !, suggestion is that you seek this out, have a dance for a wee while, then accept that Mirror! Mirror! aren’t the shout their name aloud act that such exciting grammar initially suggested. Oh well. The Duke Spirit’s Leila Moss possesses the sort of voice that could melt the heart of the most hardened critic, but her band’s output of late has been best assessed as tame, the wild spark of their 2005 debut LP Cuts Across The Land. This single’s nicely paced in a weird ‘60s girl-group fashion, all harmonious group vocals and barroom piano clinks, but struggles to be anything more than the simple sum of its parts. There’s no charisma, no character, nothing that grabs. It’s just pleasant enough sound fit to fill a silence. The one that sounds most like a level from Streets Of Rage II is plucked from its album placing and given the standalone treatment to decent effect – its self-titled parent LP is more a collection of potential singles than any sort of coherent album in a single-body-of-work sense, anyway, a la Simian Mobile Disco’s debut of last year. Antony Hegarty croons above crisply retro house beats, folk on the dancefloor get their pits damp in appreciation, and everyone crawls home happy. Yes, more singles than these ten can be found today at your local record emporium of choice, but my tea’s getting cold.